A selection of useful tidbits of information for the aquarist. Readers are encouraged to send their tips to terry@advancedaquarist.com or to post them to our Hot Tips sticky in the Reefs.org General Reefkeeping Discussion forum for possible publication. Next month’s Hot Tip theme will be Skimmer Tips. Mount hard coral frags on plastic golf tees. Using plastic golf tees makes it easy to place coral frags into your rock work. Either drill a small hole in one of your rocks with a mason bit or find a suitable hole that’s already in your rock work. I use a pair of heavy duty kitchen shears to cut frags from LPS. I just find a place where there is no flesh on the skeleton and “brake” it with the shears. For thicker SPS corals, use a pair of tile snips to shear off frags. 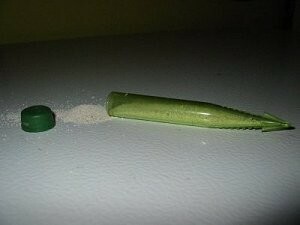 It keeps your fingers from becoming infected and prevents collateral damage to surrounding polyps. Use superglue gel. Put a blob of the gel on the frag where it is going to get attatched to the rock or glass. Dip the frag in the tank and pull it out again – this allows a superior skin to form on the glue and you won’t have to hold the frag in place very long before the glue sets. Press the glue against the rock or glass where you want the frag to go, the skin breaks and the glue sets. All done, and it is easy to move the frag in the future. This tip was given to me by KevD. Feed your ricordia. This is good for one of two purposes. Feed a piece of mysis or brine to each polyp a few hours before you intend to photograph the tank. This should convince your ricordia to fully open once it has finished it’s meal. Also if you want to encourage your ricordia to split more frequently feed it this way as often as you remember to do it. Once every week or so should be often enough and you will find that your ricordia splits more frequently than it did before. For LPS or SPS you can use rose/flower holders to hold frags in place. Basically, fill up the holder with sand or tank water, put a couple small slits in the top plastic, and then push your frag into place. The plastic cap will hold the frag just fine and in a couple weeks the frag will base out. The first picture is a picture of a disassembled rose holder with sand. 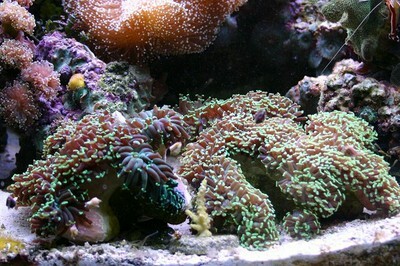 The second picture is a frag of M.digitata in my tank. 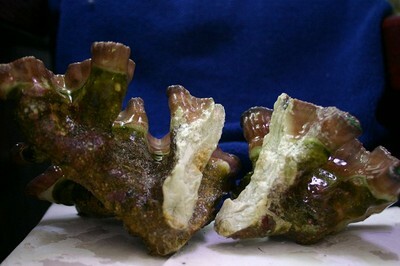 Photo 2: Montipora digitata held in rose holder. If you’re having problems finding mounts for your corals, you can go to your local hobby center and buy bags of marine decorator shells. Simply superglue the frags down and you’re done. 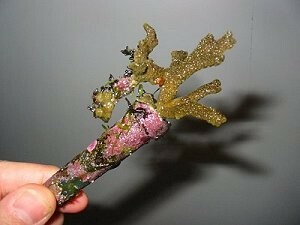 When fragging non-branching LPS corals, use a rubber band placed around the fleshy portion of the coral. After approximately 6 weeks, remove the rubberband (notice the clean white skeleton exposed). 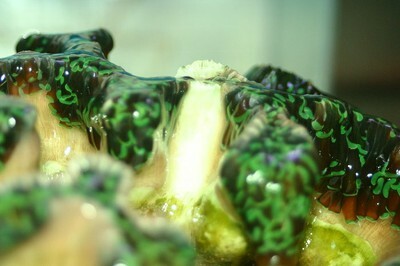 Using a dremel tool, carefully cut the coral into two along the line created by the rubberband. I have used this technique several times with 100% success. There is still risk of infection using the rubber band method: you still are killing portions of tissue and allowing necrophilic bacteria to invade the area. Where as Paul Ifkovits uses a rubber band, I use 5% Hydrogen peroxide (store bought molarity/strength) to kill the tissue where I’m going to cut a frag off. This is done quickly before the break. Not only does the peroxide denature the tissue at the spot it is applied, it also disinfects it. 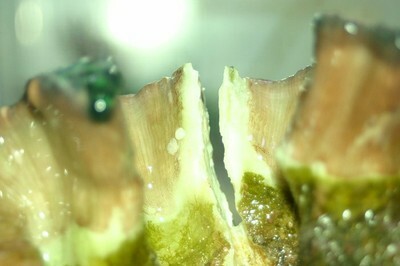 Immediately after propagation, cyanoacrylate-based superglue gel is applied to the broken edge of the tissue to provide a seal. For brain/massive coral, use a dremel grinding/cutting disk to cut the frag. Also a very successful technique.